Members of the Sikh religion are the only religious group in America who wear a turban as an expression of their belief and commitment. This has resulted in Sikhs being mistakenly identified and profiled as representatives of the Taliban organization of Afghanistan. 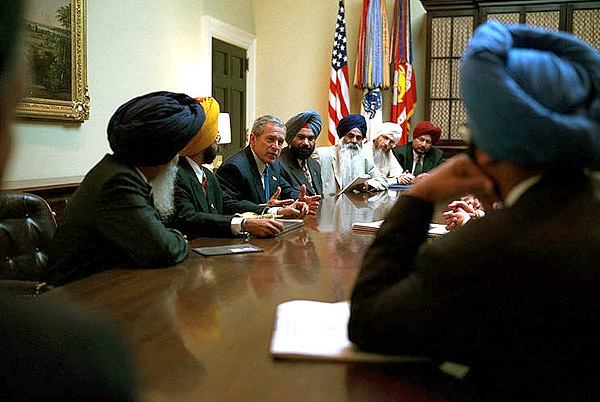 There being no connection between Sikhs and the Taliban on any level, and as a result of the efforts of many Americans, the Patriot Act of 2001 was approved in the House and Senate, and signed into law, October 2001, by President G. W. Bush of the United States. More powerful than a resolution (which simply states the sentiment of the Legislative Branch of the government), the Patriot Act of 2001 has been accepted by both the Congress and the President as a law that governs the entire United States. The legislation, S.Res.74 and H.Res.255,specifically calls upon local and national law enforcement authorities to "prosecute to the fullest extent of the law all those who commit crimes" against Sikh Americans, and states that "the civil rights and civil liberties of all Americans, including Sikh Americans, should be protected." This law calls for the condemnation, prevention and prosecution of hate crimes against Sikh Americans and all Americans, and also the protection of the civil liberties of Sikh Americans and all Americans. President Bush, upon signing the legislation into law stated, "Today, we take an essential step in protecting the Constitutional rights of all Americans." White House photo by Tina Hager.